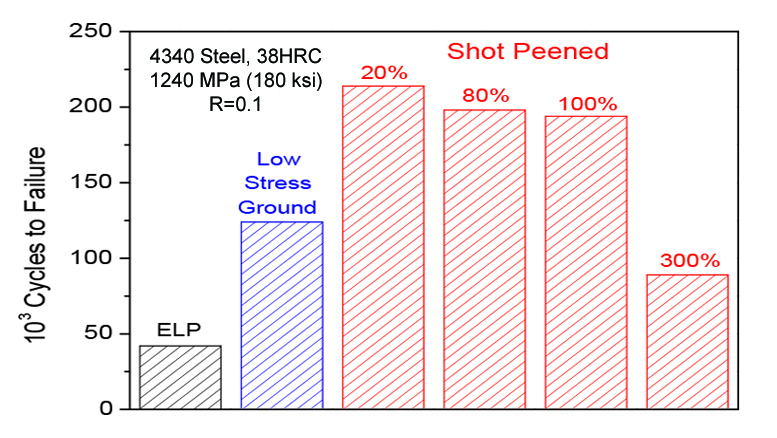 Depth and magnitude of compression from shot peening 4340, 50 HCR steel with 3% to 400% coverage, showing no improvement over 20%. Shot peening is the most widely used surface enhancement method. It is used in industries across the world to improve fatigue performance in critical components. What some users aren’t aware of is there is a more efficient and cost-effective way to shot peen. 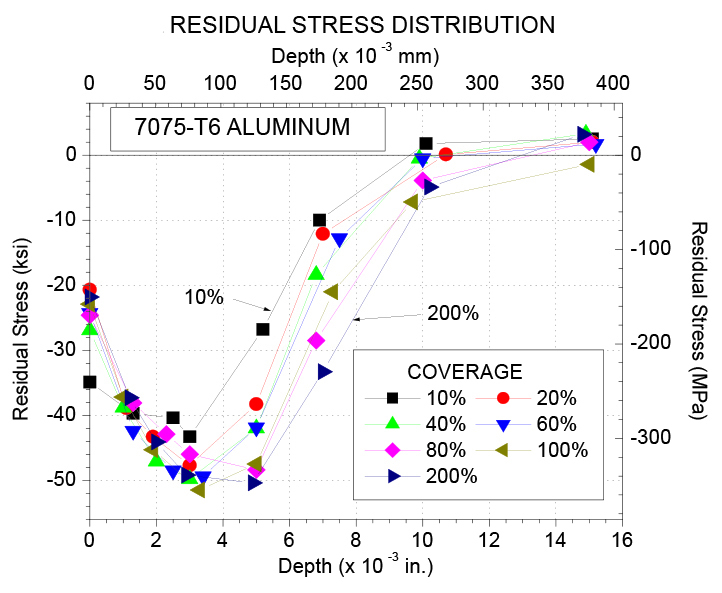 Almen strips are used to establish a saturation curve and control peening coverage to 100%, or often higher. The 100% coverage requirement is based upon the assumption that every point (or nearly every point) on the surface must be impacted to impart uniform residual compression. This has been proven false. Because of the random nature of shot impact, 100% coverage can only be approached asymptomatically. Actual “full” coverage generally ends up being 95%-98%. Even peening at 200% and 400% coverage leaves some areas with multiple overlapping indents, while others remain untouched. Repeated impacts from excessive coverage can damage the surface by creating laps, folds and micro-cracks. This is especially true when peening sharp features, like edges, bolt-holes and corners. Additional coverage extends processing time, reduces production rates, and increases costs. Increased peening coverage also increases wear on the peening equipment and media consumption, all while potentially damaging the peened surface and reducing the final fatigue performance. Our patented Optimized Peening Service1 improves production rates & fatigue performance while reducing costs and the chance of peening-related damage. Both empirical2,3,4 and analytical5 studies confirm that full “100%” peening coverage is not necessary and may not even provide the best fatigue performance. Compression is now known to extend as far as five timse th eimpact dimple radius, so regions between impacts are in compression, not tension. 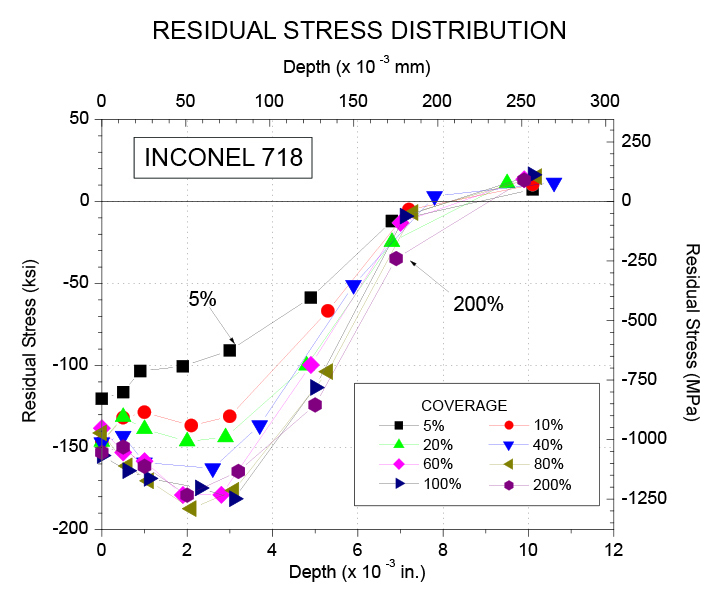 Because surface compression is supported by subsurface equilibrating tension, surface fatigue initiation is suppressed even at lower coverage. 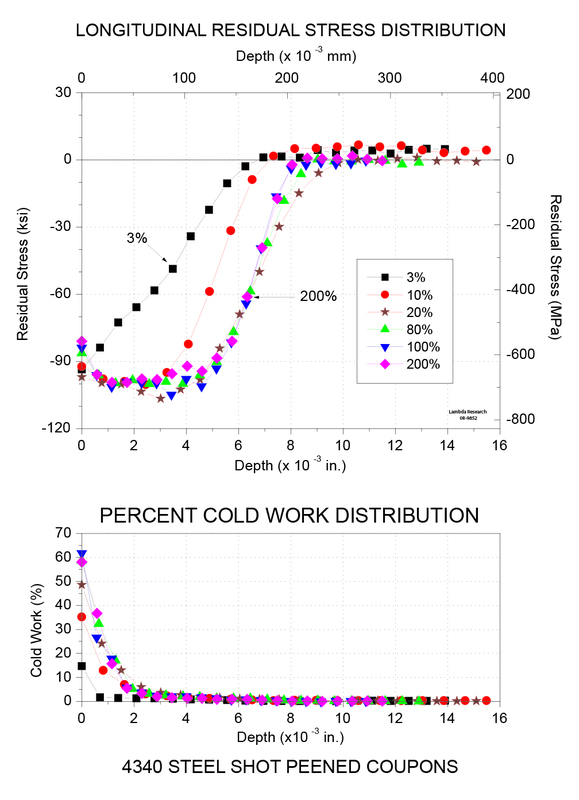 Reduced repeated media impacts provide the additional benefit of lower surface cold work. Work softening of hardened steels is thereby reduced and the thermal stability of the beneficial compression is improved. With our cost-effective shot peening optimization service, the peening specifications of any component can be tailored to achieve optimum fatigue performance with faster processing times in your existing production facility. This means faster production rates, less media consumption, lower production costs and better fatigue performance. Contact us at 1-800-883-0851 or info@lambdatechs.com to optimize your shot peening process.